The religious iconography, under a western point of view, is an integral part of the culture and Nihil is well aware of this. His striking photographs reflect that mystical halo almost lost in the religious iconography of these last centuries. The fascinating world of Nihil feeds of literature and life experiences. As an adolescent, he was writing stories and creating a parallel reality, building his own world and vision. Eventually it was materialized in his stunning photographs, whose symbolism, mystic and mostly beauty, immerse the viewer in a fantasy world both real and unreal, known and unknown. In short, a world where you can delve and that is very difficult to escape. – EMNMM. You’re known as Nihil, a curious and mystic artistic name, which means “nothing” in latin. Why this name? 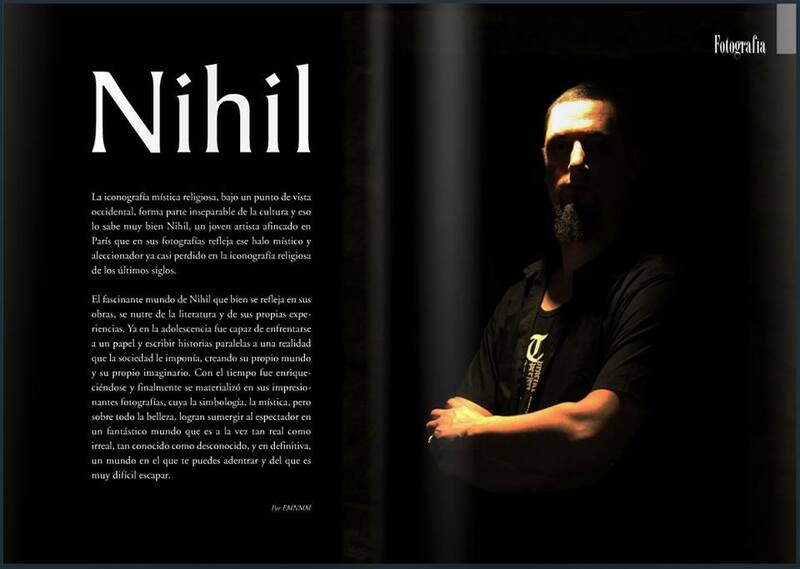 Who is Nihil? – Nihil. A lot of people suppose it’s a reference to political nihilism or to a nihilistic way of life, but it’s neither. It’s a symbol of my quest for identity and my attraction-repulsion relationship to anonymity. It could have been “no-name” or a number for instance. The same theme appears in my pictures, where most of the characters have no face or a masked face. For a long time, my name was nowhere to be found on my own website and my pictures had numbers as titles. At some point, I figured it was too much obstacles for everyone and went back to a more traditional naming system. – How did you get your first interest in photography? – I bought my first camera to keep me company in some urban exploration trips and after a while I started to work with models, just to test some ideas. I’m not very interested in photography itself: I don’t see any point in capturing reality as it is, I want to alter it. Photomanipulation give me a lot of new possibilities to do this. – I used to write a lot since I’m 11. But it progressively became complicated to reach my own quality standards, and the whole thing was neither fulfilling nor fun anymore. So I just switched to an easier art form. At the time I was writing some mystic and apocalyptic short texts that work well with my pictures. I generally try to include them in my projects. For example, for my Berlin solo show I printed some of them and exhibited them along the pictures. I don’t plan to write again anytime soon, but I still consider myself a writer primarily. – Your work is really amazing, full of mysticism influences, what are your artistic influences? – What is your creative workflow? – Inspiration is generally not a problem : sometimes I just need to close my eyes to have surreal images pop up. I don’t try to elaborate projects around intellectual concepts or meaning, I just try to imitate my visions as good as I can. Some pictures need weeks or months of work (photomanipulation being the longest step). The many obstacles and constraints of the process and my lack of skills often force me to give up on some elements and inject some others. It often results in images drastically different from the initial idea. Sometimes, the meaning of a picture appears after it’s finished, or when people ask me about it. Sometimes, I never find out any meaningful explanation for it: I guess it relates to more or less subconscious matters. – Is there a personal story behind your photographs? – Sure. I am very sensitive and witnessed a lot of awful things in medical research centers and hospitals where I used to work. I had to express the resulting anguish somehow. This is where the medical elements and the emaciated look of my characters come from. The religion is also a personal story, a long and complex one ! – Tell us more about this story. – When I was a kid, my parents and I moved in a very isolated village in the center of France. Everyone was going to church and I was in a catholic school. Things didn’t go well: I was a “stranger” and I got rejected. As a reaction, I stopped every social activity including going to church. I was eleven. I started writing and creating my own rebellious religion. I remember drowning in books and lonely walks in the woods. My relationship to religion stayed rocky for many years and I read a lot about it. Progressively, I discovered more intimate spiritualities, disconnected from the social function religion usually fills. I read books about christian monks and indian gurus. I became more and more fascinated. It’s complicated to deal with my rejection of religious institutions and at the same time with my attraction towards individual spirituality. It’s been a while since I didn’t read anything else than sacred texts : Upanishads, the Bible, shamanist texts, the Norse Edda and so on. I’m still skeptical about abrahamic religions, that I find naive and dogmatic, but indian philsophy was a huge revelation for me. As an occidental citizen, I’m still keeping a “scientific”, neutral approach, but deep inside, I regret to be unable of faith. We’re not living in a religious society anymore and my education is all about skepticism and doubting. I’m more or less certain that if I was born in a more religious era, I would have been a monk or a priest. I think I use art as a low-level replacement. – Saints, abandoned places, martyrs… What themes were you exploring earlier in your photography that eventually led to this? – I started visual creation a few years ago and these themes were already there. My older texts testify it’s with me since a long time. When I was 11, my very first text was a fictive mythology. I guess I’m still working on the same matters. – The models in your work are often friends even take pictures of yourself, why? – They are familiar with my universe and easily understand what I ask them. Photomanipulation is there to transform anyone into anything, so I’m just taking the easier way. – The study of the human form, the masks… How would you define your work? – I see my work as religious art. My approach of the human body is the same as medieval painter Matthias Grunewald and a lot of religious artists of the end of the middle age: showing the human body in all its fragility, decay and suffering to underline the transcendence. I also would define my work as symbolist art: a lot of elements are there to evoke a more complex idea. Even if the audience has no idea what an element means to me, I hope it will somehow ring a subconscious bell. To give one example, when I add a scar on the chest or abdomen, it implies that the intern organs of the character have been removed and the body is now shallow. The scar is for me a symbol of existential emptiness. – Masks are recurrent objects in your work, why? – In my pictures, I use masks to enforce anonymity. It’s a symbol of the quest for identity. It changes a human person into an archetype. Also, I use them to make the character blind, mute and deaf and to force him to retreat in himself. The transcendence is an interior path. In my view, one has to negate the outside world and its own individuality to access the divine serenity. – Where we can enjoy your work? – My next exhibitions will take place in Paris in September and London in November. It will be collective shows with exciting programs but I can’t tell you much more for now because nothing is official yet. You can get more information on my events on internet : my website (www.nihil.fr) is the place where you will find all my works, including the texts. My Facebook page (www.facebook.com/leventre) is a good place to follow my news. I often share works in progress and reflexions. – What are you plans for future? – I guess I would like to make an art book that would include both my pictures and texts. But I don’t stress too much over my artistic future. I try to deintoxicate myself of ambitions, plans, projects and all these. I don’t want to be some kind of art employee with a career plan and expectations if I can avoid it. I just want to live simply and express what I need to express. If opportunities pop up, it’s fine, if not, I’ll survive.